Kalalau Valley on the Island of Kauai is widely photographed and renowned for its beauty. Part of its charm is that the mists and clouds often hide it from view. The only way to get to the valley, other than by ocean or helicopter is to walk a challenging 11 mile path in the mountains. 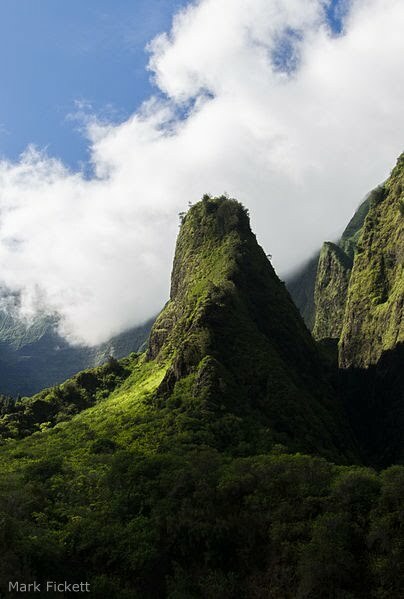 It was such a remote and hidden valley that during the 1800s, with the outbreak of leprosy in the islands, lepers fled to Kalalau valley to hide. They did not want to be taken away from their families to the leper colony on the island of Molokai. Kalalau Valley is also famous for hippies since the 1970s. It is still known for its hippies and new age spiritual seekers who go there for vision quests and to get away from civilization. On Oahu, there is the Valley of the Temples, with a beautiful and large Japanese temple. It’s a beautiful place for meditation and escaping the bustle of Honolulu. On the Big Island, there is Waipio Valley, which has a beautiful vista and many taro fields. Nearly six miles deep, it is also called the Valley of the Kings and was a religious center and home to high chiefs. It was also the site of a devastating tsunami in 1946. The floor of Waipio Valley on the Big Island of Hawaii. Photo by AlaskaDave on Wikipedia Creative Commons. On Maui, there is Ia’o Valley, where the Ia’o Needle overlooks. It’s a prominent geological formation and also the site of a bloody battle between the troops of King Kamehameha I and the chiefs of Maui. There is a legend that the needle formation is a lover turned to stone. Iao Valley with Iao Needle (the pointed geological formation). Photo by Mark Fickett in Wikipedia Creative Commons. I've been to Waipio Valley and I'ao Valley so far. Both are beautiful places that I would like to visit again. After reading the description about the battle in I'ao Valley, I had a hard time not imagining all the dead men laying where I stood. You have! Wonderful! Some people can feel that energy and are uncomfortable. Others feel the energy from before there ever was a battle and say it's very powerful and divine.